PUC Schools | PUC Schools Welcomes 7th Alumni Teach Project Cohort! 25 Aug PUC Schools Welcomes 7th Alumni Teach Project Cohort! We are excited to welcome six new teaching residents into the Alumni Teach Project (ATP) program this year. The ATP program was created five years ago as one way to fulfill PUC commitment #3, which states that students will commit to uplift our communities now and forever. 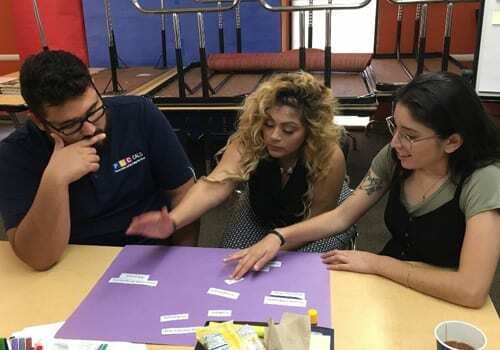 ATP is a culturally responsive Urban Teacher Residency Program that is designed to cultivate and foster leadership skills in new PUC alumni and PUC community educators in order to increase equitable access to highly effective teachers and improve outcomes for all current PUC students. Since beginning in 2013, the program has trained 29 teachers to fulfill full-time teaching positions within PUC. 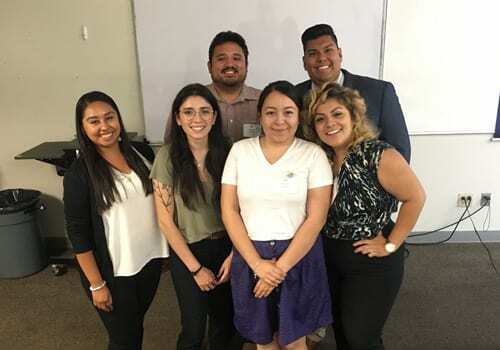 This year’s cohort includes four amazing alum and two community members: Olga Angulo, Sandra Cardoza, Jenecis Duran, Jose Gomez, Beatriz Sanchez, and Daniel Zepeda. Olga attended Community Charter Middle School in 2005 and graduated from Community Charter Early College High School in 2012. She aspires to support and mentor students with learning disabilities and will be working as a resident at Nueva Esperanza Charter Academy Middle School as an Inclusion Specialist with Delilah Jimenez as her mentor. Sandra attended San Fernando High School, but is familiar with the PUC community since both her youngest siblings attended Community Charter Middle School and/or Community Charter Early College High School. She also worked as an Inclusion Assistant at Lakeview Charter Academy last year. This year, she will be embarking a new journey as an resident at Community Charter Middle School under the guidance of Lindsey Housenick in a 7th grade English classroom. Jenecis joined the PUC community as the After School Coordinator for iPrep after graduating from UCLA. She will be working as a resident in CALS Middle School with Nancy Montoya in an 8th grade English class. Jose attended Triumph Charter Academy and Lakeview Charter High School. During his time at UCLA, he was involved with the Gates Millennium Scholars program and Bruins Movin’, developing a passion for serving those in his community. He is excited to start his residency at his alma matter, Lakeview Charter High School as a resident with Chris Fong teaching high school history. Beatriz attended both Community Charter Middle School, and Community Charter High School, where she realized her passion for teaching. While a full time student at Cal State Northridge, she worked at Community Charter Middle School as an Afterschool Site Coordinator. She will be working as a resident at Community Charter Elementary in a first grade classroom with Chantel Lopez. Daniel is an alumni from CALS Middle School and ECHS who attended the University of California, Santa Barbara. After graduating from UCSB, Daniel returned to CALS MS as an Inclusion Assistant. He will begin his year as a resident at CALS Middle School in 6th Grade Humanities class with Joe Garza. This is a talented group of passionate educators who are dedicated to uplifting their communities. 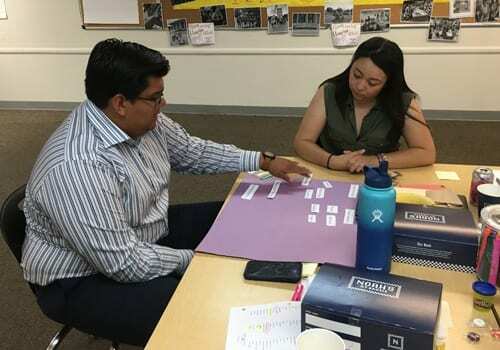 This summer, they learned the foundations of the ATP curriculum and teaching through attending a 3-day Jump Start experience as well as New Teacher Learning Lab. They read and analyzed several foundational texts including Milner’s Opportunity Gap Framework and participated in a Community Circle with Dr. Elliot. 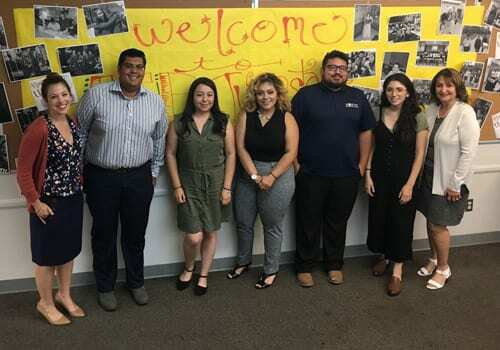 After these experiences and meeting their mentors, they are ready and excited to start the school year and their journeys to becoming full-time PUC teachers!